It’s the second half of the year! Welcome to July. The above verse say it all; God is not bound by human calendar and times, He always comes true in His time. I wish everyone a beautiful month of July, I hope you have the best of days. It’s been awhile, how have you all been? I’ve missed you all too, I hope you missed me? So, I have decided to start a new segment called the beauty review where I will review beauty products I’ve used and share my thoughts. As a beauty addict and merchant, I have used some truly wonderful products and some not so good ones, and one of the problems I have always encountered is finding credible (not-sponsored) reviews online, or any reviews at all especially about Nigerian products. This product is nicely priced at N1,000 for a 250ml bottle (good). 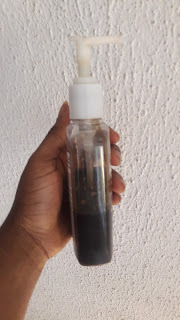 I stumbled on this liquid black soap after seeing it reviewed on a post on Bellanaija, I searched the web for it, got on to R&R Luxury’s website, ordered and it was delivered to me the next day (nice!) I didn’t like the fact that I had to pay N1000 for delivery from Lekki Phase 1 to Ikoyi, but I couldn’t go pick up, so I paid. It arrived in a paper bag, with a clear film sealing in the product. I don’t think this packaging will travel well with an out of town delivery, but I had no issues, no spills; so I’m fine with it. But, like I said; I hope R&R luxury has a better plan for out of town deliveries. R&R boasts their skincare products contain all natural products with 100% pure unrefined shea butter as it’s main ingredient. Others are; coconut oil, cocoa pod and cocoa butter. And they say it’s perfect for the whole family. So, I got home that day and excitedly used the soap that night. I followed my normal wash routine; wipe of makeup with baby wipes; wet my face with water, squeeze some soap on my hands and lather my face. It lathered very well, smells like black soap (I don’t mind), didn’t irritate (I have sensitive skin and products can irritate in a second). The attendant I spoke with on the phone in the course of placing my order had advised me not to let the product sit on my face for too long, i.e: not use it as a mask; but altogether I think it was on my face for about 30 seconds or more (the time it took me to use the washcloth on my face). I used it with the regular baby face towel and it cleaned really nice. But then, I discovered another problem; I’m used to my face wash bottle having a pump, this didn’t and I found the lifting and the dropping of the bottle cumbersome. So, I searched for an old bottle of face wash which had a pump head and transferred. R&R Luxury might want to invest in a pump head bottle for ease of application. So, I’ve used it for over two weeks and I think I can safely say it’s a good product. I’ve had no irritations, not even product adjustment. I transited from my old facewash to this seamlessly. It can be used on the face and body, it’s non-drying, not excellent, but a good product. Will I buy again; Yes, and I recommend it too. There’s a link to R&R luxury online shop below, please follow the link to shop and enjoy. Till another product review; have a blessed week. PS; This is not a sponsored review, and I will be back to update if I have any issues. Happy New Month, Welcome to April! It’s April and we are officially into the 2nd quarter of 2016. How are you all doing, I hope the year has been good for you despite the challenges facing the country? How are we doing with our to-do list? I hope we’re successfully ticking off certain things in the list? God will give us all the grace to achieve our desires; amen. As the new month begins; I wish us all the best; springs in desert, help from the most unexpected sources, needs met, joy in our heart, loved ones all around and enough to eat and to give out. How bless us all, and…. Hyper pigmentation is something that has plagued me as far back as I can remember. Dark spots (or hyper pigmentation) occurs when there is an over-secretion of melanin (the pigment responsible for skin colour). This can be caused by various reasons, including hormone imbalance, acne scarring, vitamin and mineral deficiencies, stress and pregnancy. It’s best to check with your GP to find out what the cause is for you but when they do occur you’ll be glad to know there are a few ways to get rid of pesky dark marks. Dark patches and discolouration is often evident in dry skin and dryness is worsened by extreme weather, both hot and cold. Drinking plenty of water will help keep the skin hydrated but try to moisturise daily too. It’s best to use gentle, unfragranced creams suitable for sensitive skin to prevent causing any irritation. When washing, avoid scalding hot showers as this can dry out the skin and swap out any harsh soaps or shower gels for more moisturising formulas with natural oils like jojoba and sweet almond. A buildup of dead skin cells can lead to clogged pores and uneven skintone. Counter this by gently exfoliating as often as you find necessary. Exfoliation also encourages the formation of new healthy skin, making your skin appear brighter and fresher. You can use a scrub (like this one), body brush or exfoliating gloves to slough away any excess skin. 3 Natural masks By raiding your kitchen cupboards you may find a natural solution for dark marks. Lemons, potatoes, milk or tumeric can be mixed and match together into a face mask to help even out the skin. It’s best to do these treatments at night, particularly as they tend to have a subtle bleaching effect which might make your skin more sensitive to the sun. Apply for at least 10-15 minutes to give the mask time to work and moisturise afterwards to keep the skin hydrated. Natural masks are not an instant fix so repeated applications will be needed depending on the severity of your dark marks. Using a razor regularly irritates the skin and the resulting short, sharp hairs from shaving can grow back into the skin causing bumps and discolouration. You can either lessen how often you shave to prevent problems or switch to using hair removal creams or wax to get rid of any pesky hairs. The latter methods pull hair out from the root and generally don’t have to be done as often as shaving, preventing dark marks from occurring. It’s not just fair skin that needs an SPF. By applying a liberal amount of sun protection every day (yes even in Winter) your face and body is shielded from the sun rays, preventing sun damage. Several makeup and skincare brands now include products with small amounts of SPF to make protecting your skin easier. 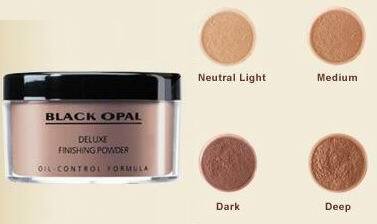 If you want maximum protection it’s best to apply sun protection separately underneath your foundation. Look for products which claim to protect against both UVA and UVB damage. If you find your dark marks particularly embarrassing a professional treatment on the recommendation of your doctor or dermatologist might be your best solution. Popular treatments which help lessen the appearance of dark marks are laser treatments, microdermabrasion and chemical peels. These treatments are more invasive than using natural products, so the effects can be more dramatic and seen much more rapidly. How do you get rid of dark marks / hyper pigmentation? What’s best for your skin is an individual thing based on genetics, skin type, special skin issues, age and other factors. But these 10 tips for women of color are musts for healthy skin. 1. Use products for your skin type. It’s important to use products that are formulated for your skin type. A cleanser for oily skin will be too drying for someone who has dry skin. Some products that work on normal skin might irritate delicate, sensitive skin. Using the wrong product can do anything from making the skin look too oily or causing breakouts, to emphasizing fine lines and wrinkles or making makeup application look uneven. 2. Avoid harsh ingredients. Certain ingredients in products like salicylic acid and even some alpha hydroxy acids (fruit acids) can be too harsh for certain skin. Chemicals like synthetic fragrances can cause allergic reactions in the skin of some women and alcohol-based products are very drying to others. Observe which product ingredients cause skin reactions and check the ingredient label for patterns and possible culprits. So if you know you are allergic or easily irritated by certain ingredients, check the list before using a product. 3. Do patch tests. If you are using at-home kits like microdermabrasion kits, hair removal systems, facial peels and other products that are clinical strength or potentially harmful, always do a patch test on a small inconspicuous area like the inside of the elbow to make sure you are not allergic to the ingredients or that your skin is not too sensitive and can be irritated or damaged by the product. 4. Cleanse the face daily. It’s especially important to cleanse the face at night to get rid of dirt and debris and of course makeup. Avoid abrasive cleansers. Opt for a sensitive formula, especially if you have dry or easily irritated skin. 5. Exfoliate. When dead skin cells accumulate on the skin’s surface, what you’ll end up with is dull-looking skin or skin that is unable to adequately absorb nutrients and nourishing ingredients from skin care products. Remember to regularly exfoliate the face, using gentle exfoliants, avoiding almond or coarse salts, which can actually tear the skin. Don’t use a body scrub on your face. And speaking of the body, be sure to exfoliate the body with scrubs or by dry brushing to avoid dry or ashy skin. 7. Use sunscreen. The sun can contribute to premature skin aging. While melanin provides protection to darker skin, you can still get skin cancer and often it’s at an advanced stage. Use sunscreen year round. 8. Be mindful of medications. Certain medications contribute to skin problems and others can cause sensitivity to the sun. Be sure to apply sunscreen or avoid the sun when using these drugs. Drugs that cause sun sensitivity are birth control pills, antibiotics, acne medications and some hyperpigmentation treatments. 9. Be careful with professional treatments. Cosmetic surgery and other professional treatments (laser treatments, microdermabrasion, etc) might cause skin discolorations and other problems in skin of color. Make sure that you see a professional that is experienced in treating dark skin. 10. Help your skin take care of itself. Lead a healthy lifestyle, with a nutritious diet, exercise and plenty of rest to help your body and skin continue to rejuvenate itself.